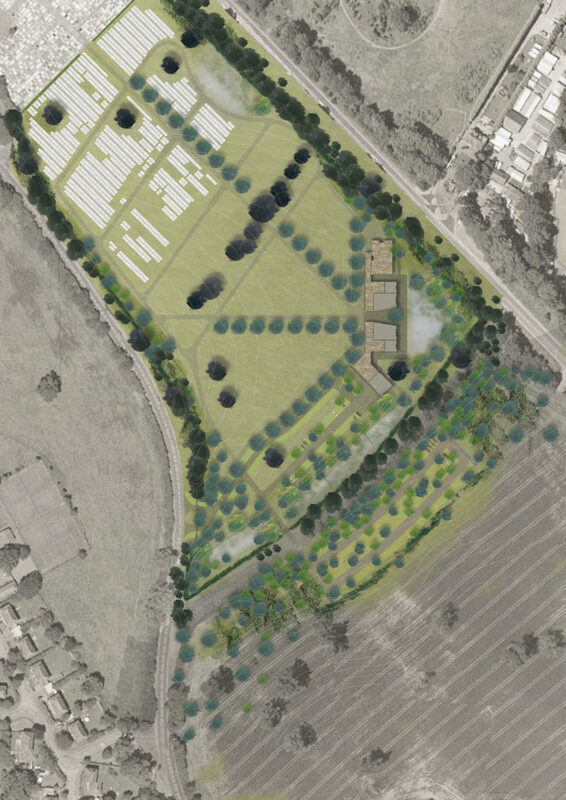 New Bushey Cemetery forms an extension to the existing, United Synagogue Jewish burial grounds in Bushey, North-west London. 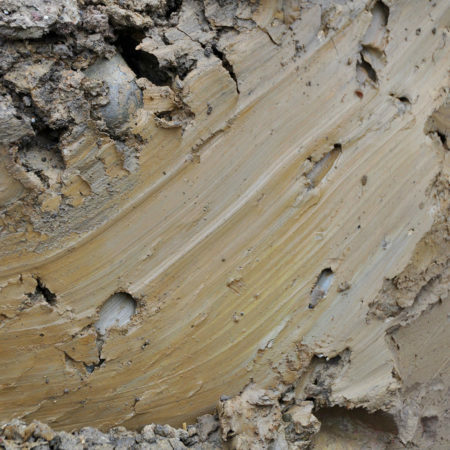 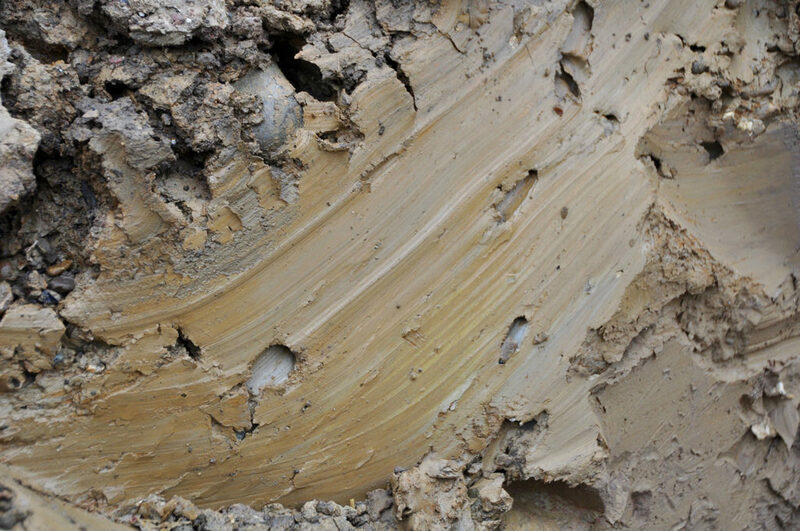 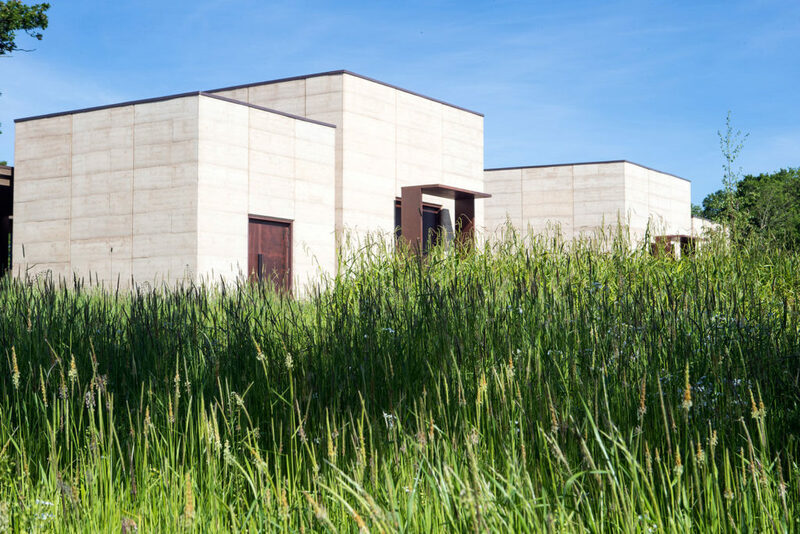 The 8 ha site evokes a narrative of earth to earth, where soil conditions influenced design approach and inspired the use of rammed earth construction and clay brick paving. 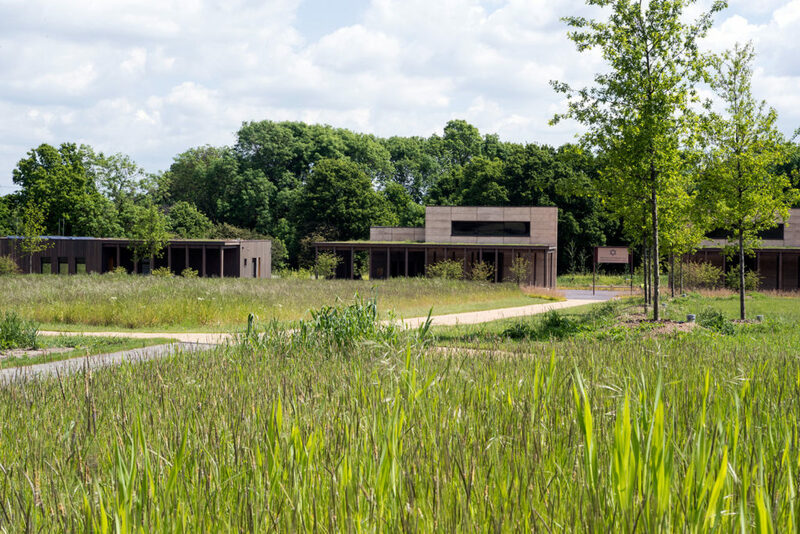 Located within Green Belt, the site required a sensitive approach to the integration of new prayer halls, mortuary, car park and burial space. 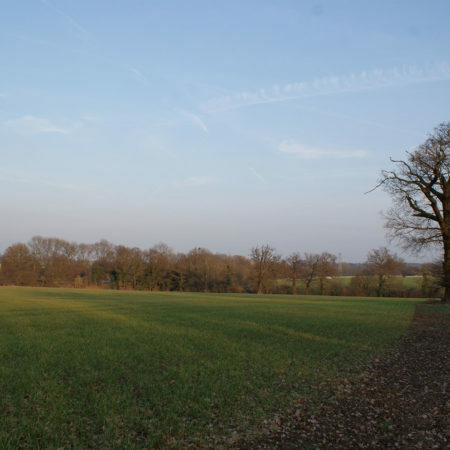 These features where gently planned to sit lightly in the undulating landscape of the Northern Thames Basin. 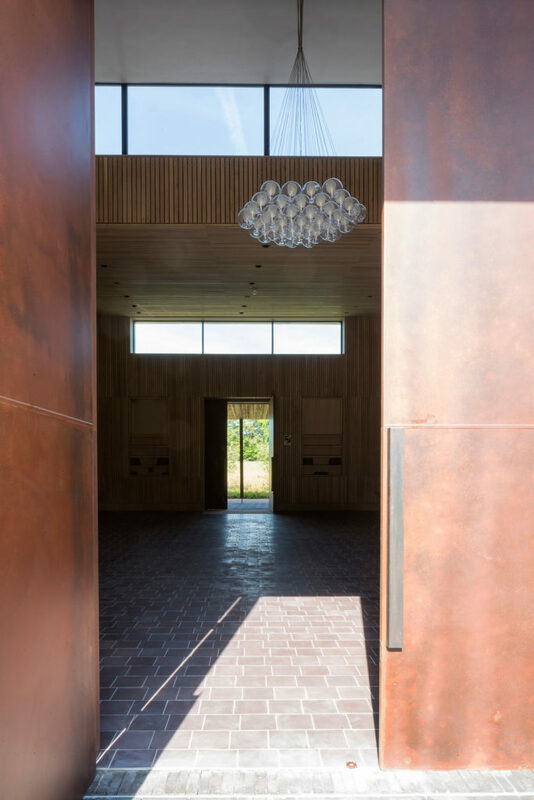 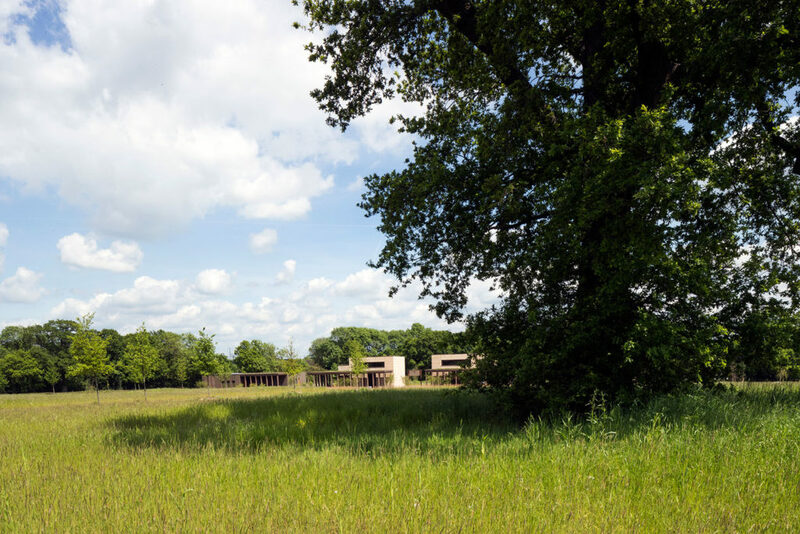 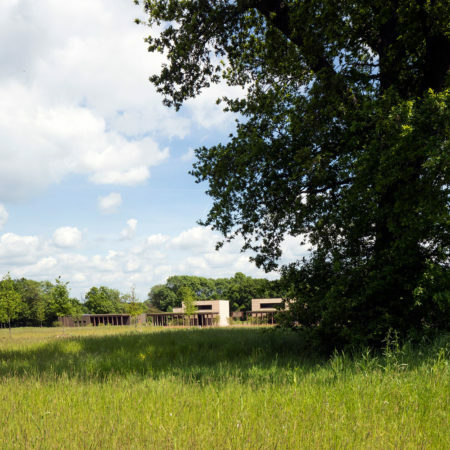 The earthen and timber-clad cemetery buildings were positioned in the lowest corner of the site, maintaining open views across the landscape to the arable fields beyond, framed and anchored by veteran oak trees that define the character of the landscape. 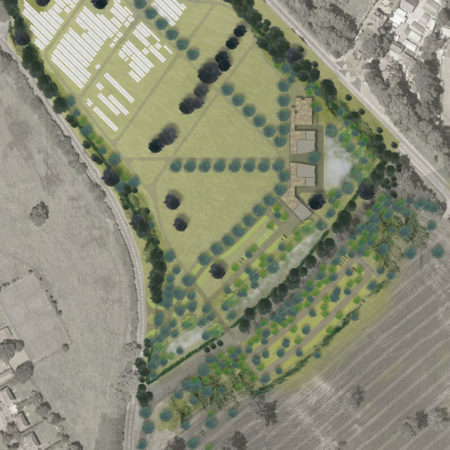 The new cemetery celebrates landscape biodiversity, using sustainable drainage systems, collecting surface water run-off from the highly impermeable London Clay soils and attenuating in a series of interconnecting swales and ponds. 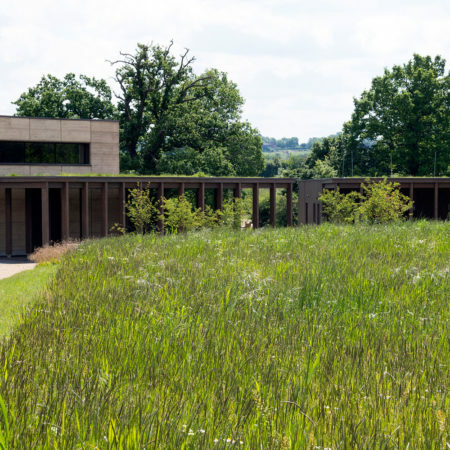 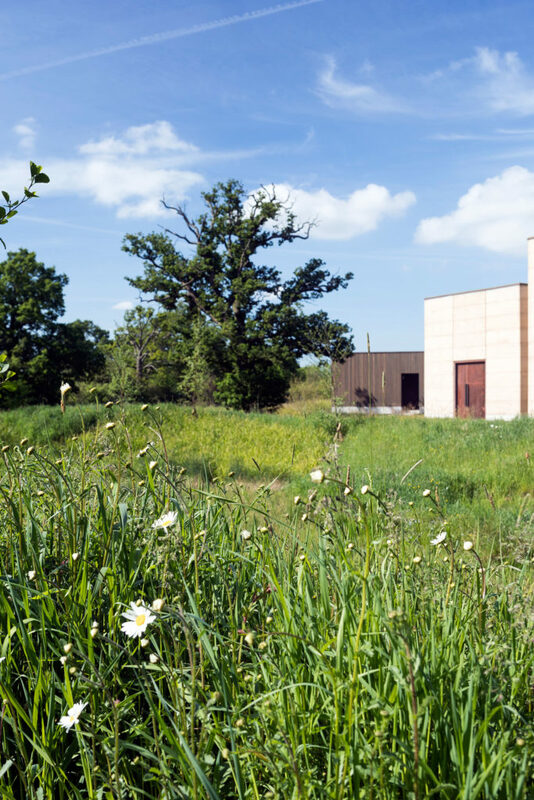 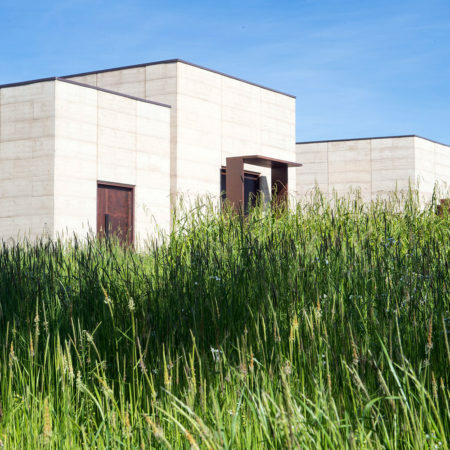 The waterbody edges merge into the landscape with marginal aquatics, specimen willow trees and reed beds that, in winter, mirror the tones of the rammed earth. 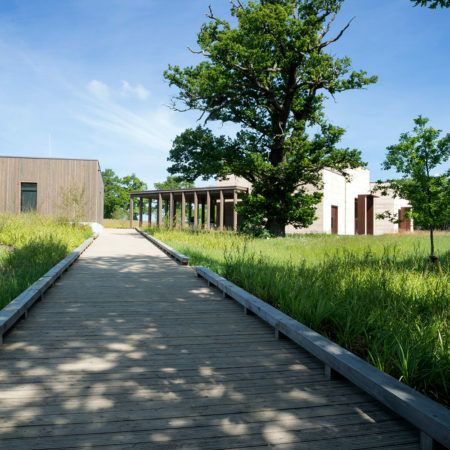 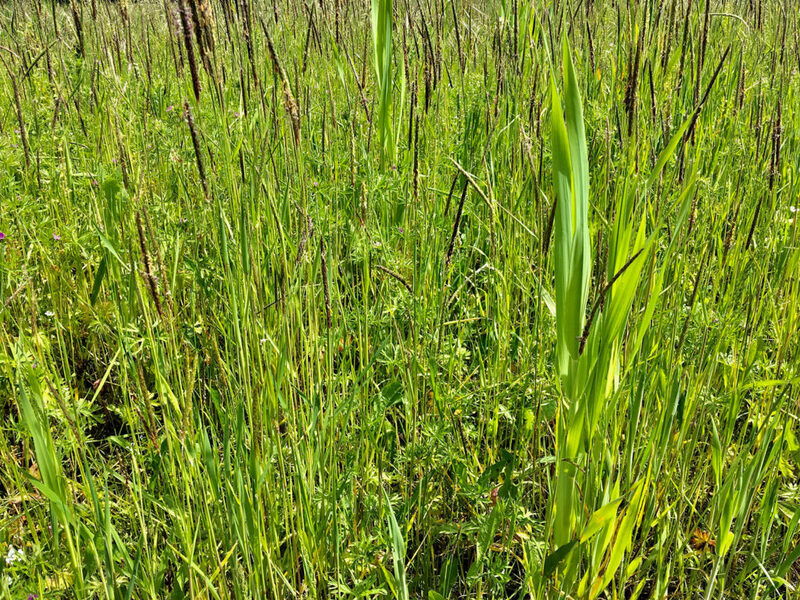 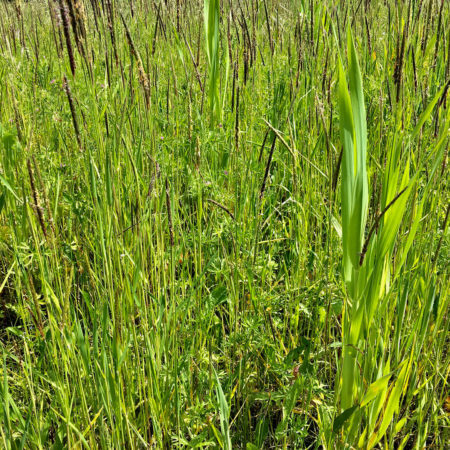 Elsewhere the planting palette uses robust, native species adapted to the heavy soil conditions. 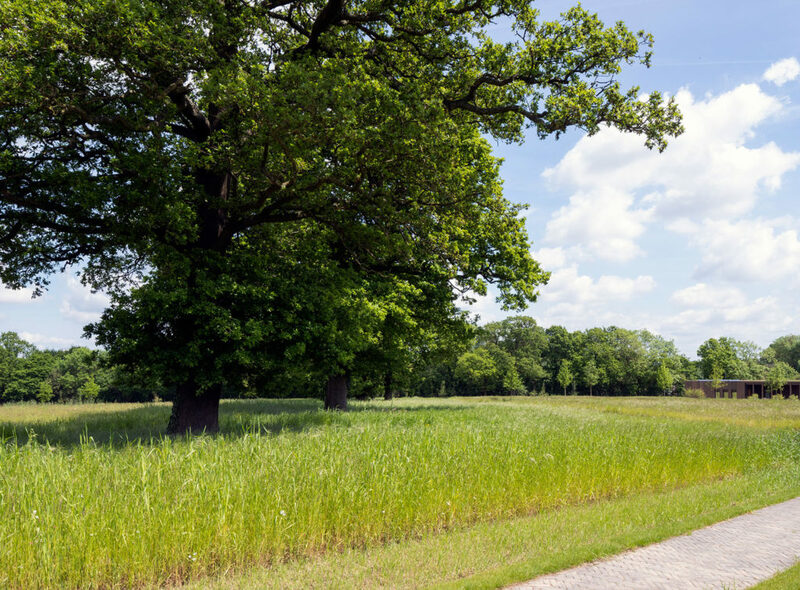 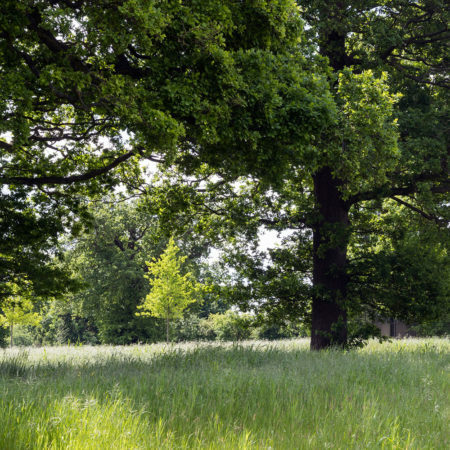 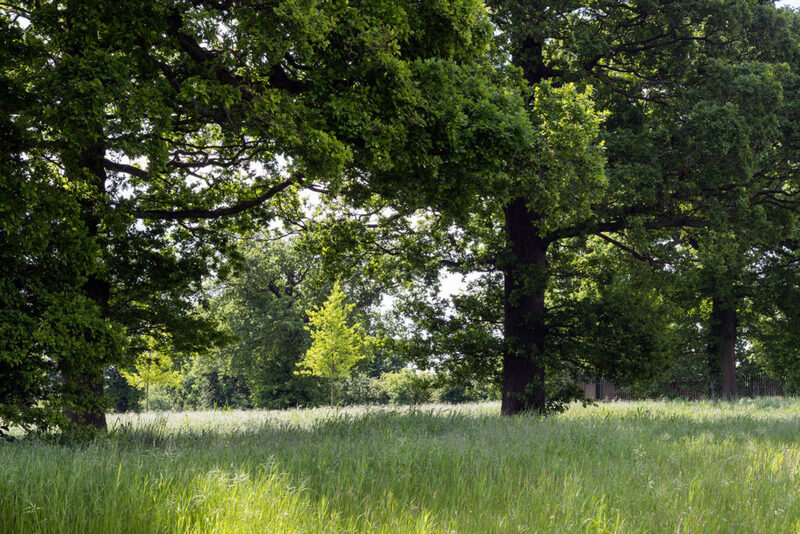 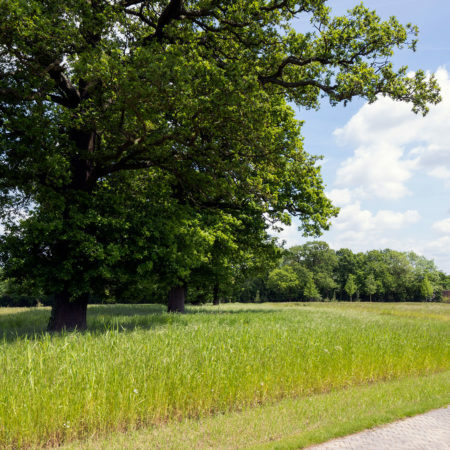 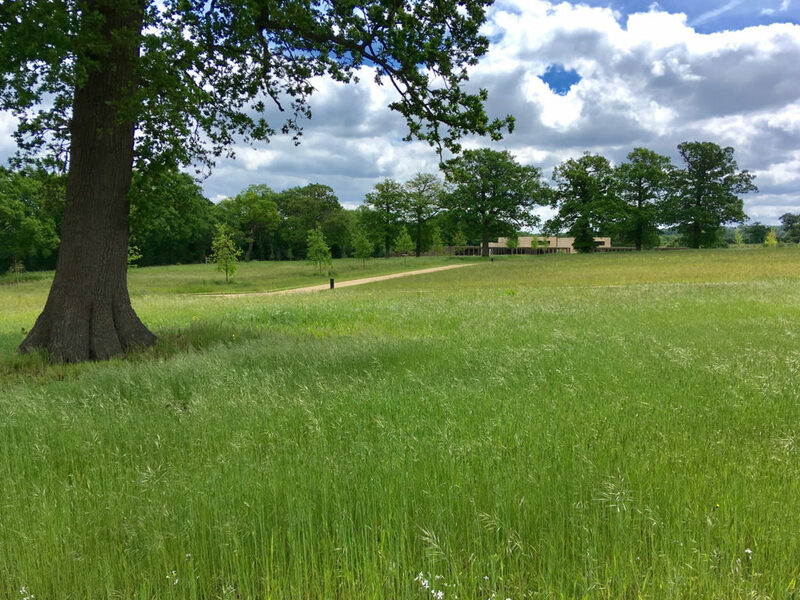 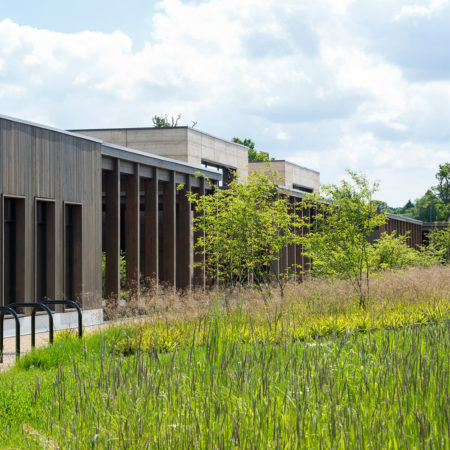 The car park is designed to recede into the background with reinforced turf parking bays partitioned with swathes of meadow and specimen tree planting with spaces demarcated by recycled log buffers. 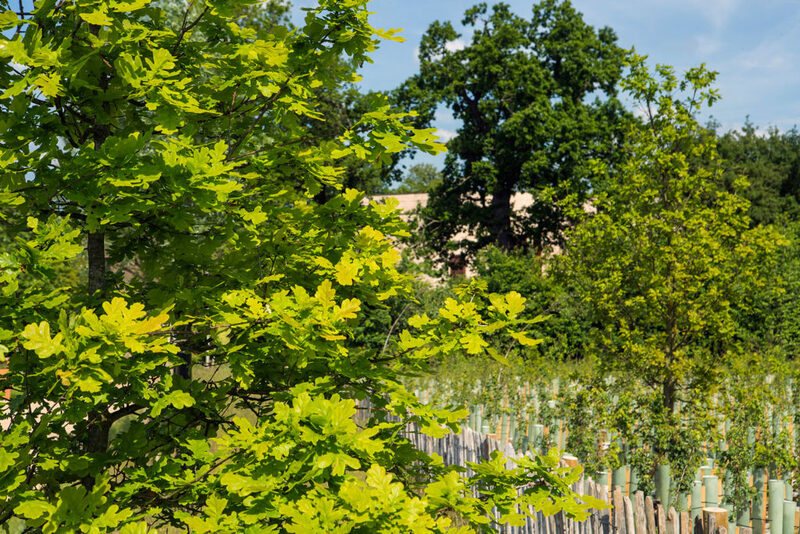 In time, the new hedgerows and woodland blocks surrounding the car park will grow to create a wet woodland setting. 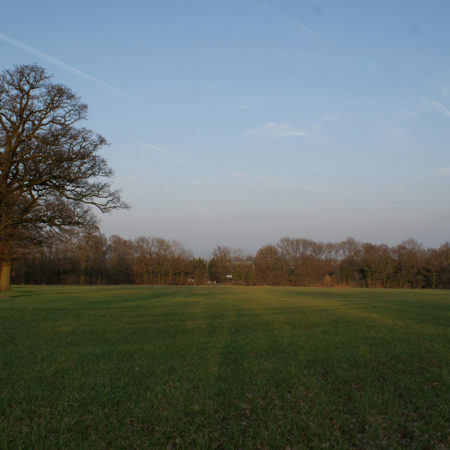 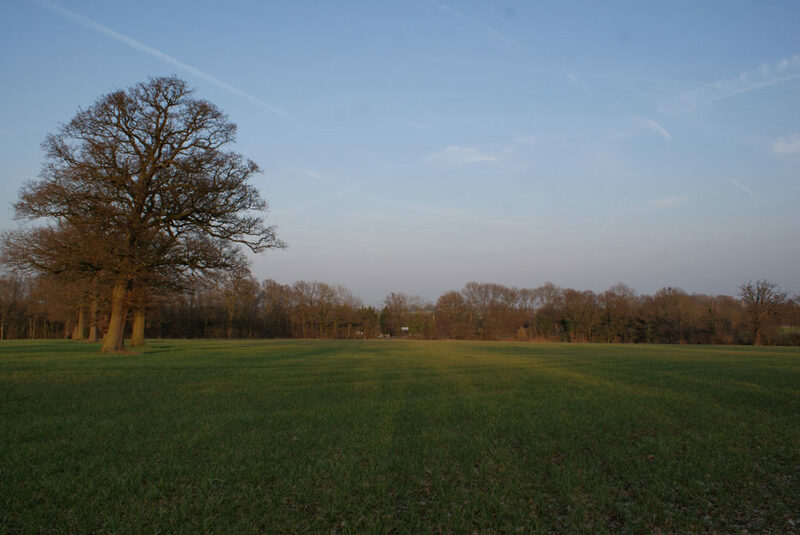 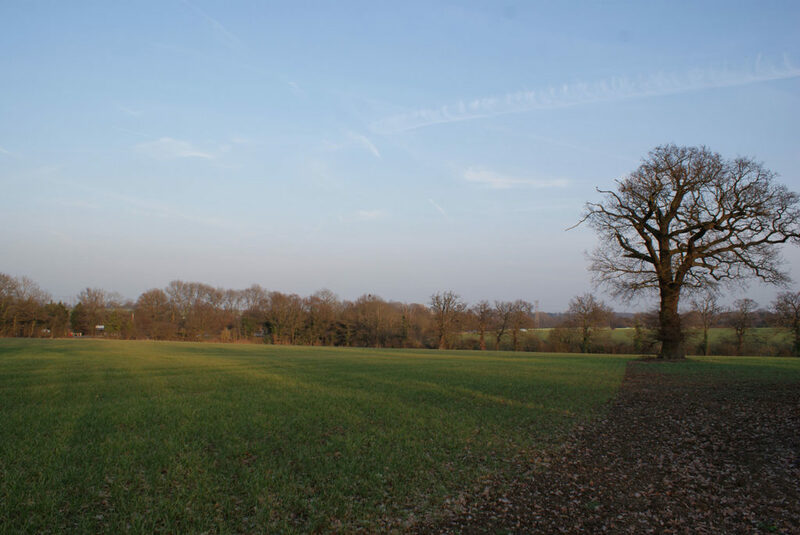 The site is bisected with a row of existing significant veteran Oak trees, vestiges of an old field boundary. 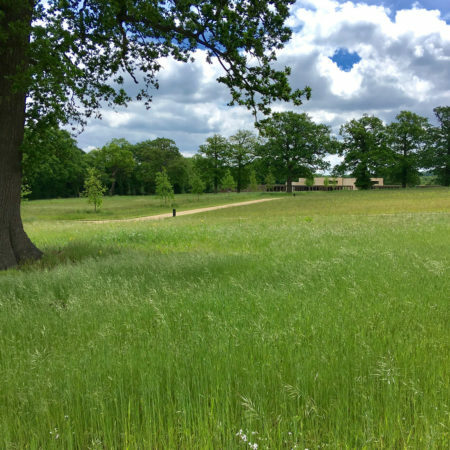 This feature is replicated in new staggered oak avenues within meadow, radiating from the Prayer Halls along the main circulation paths, and maintains an important linear ecological route when burial plots begin to occupy the fields far in to the future. 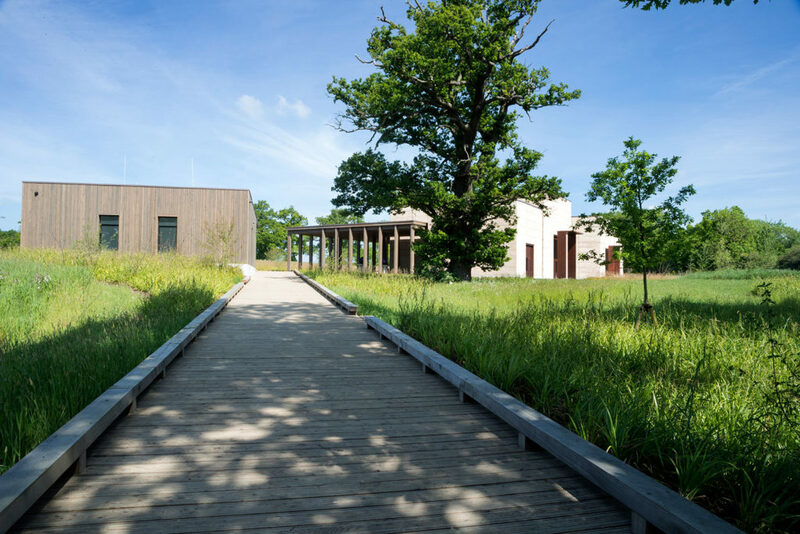 The arrival area creates a generous space circulation around a treed central landscape that will mature to provide sylvicultural interest and beauty at the point of entry, to mirror the scale and magnificence of the existing mature oak which anchors the building arrangement. 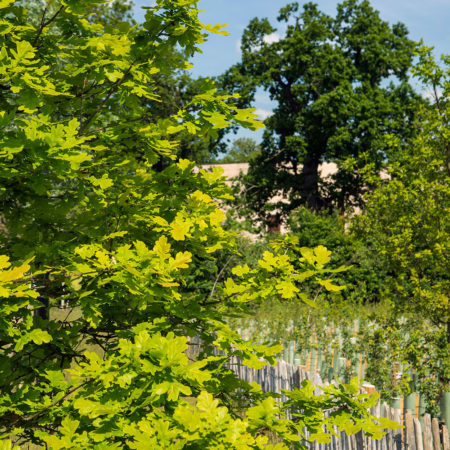 In total over 250 new trees were planted as part of the landscape design. 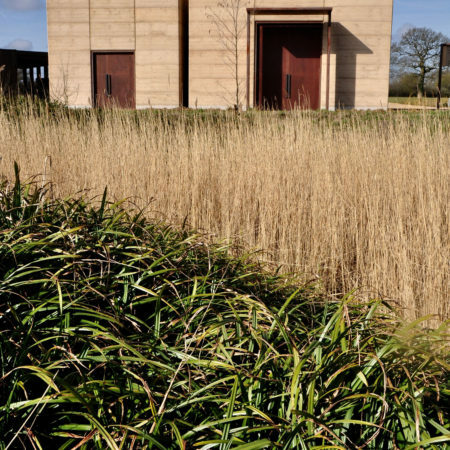 A memorial garden provides a place for sitting and contemplating close to the Prayer Halls. 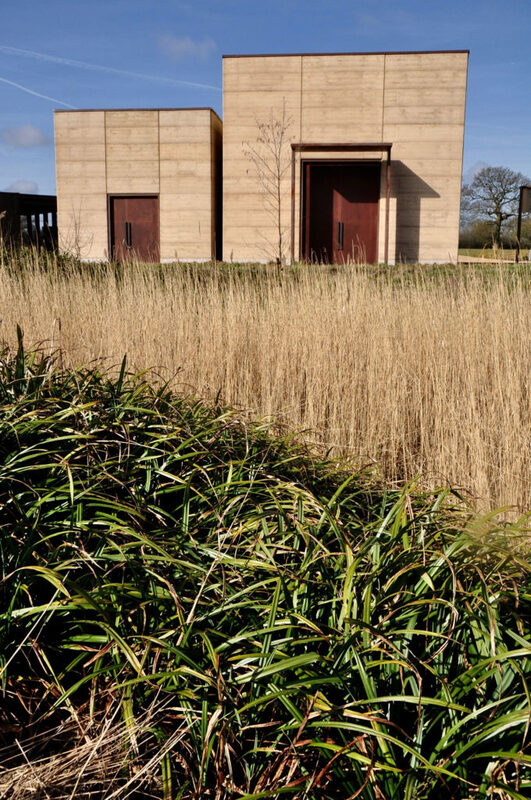 This is where markers will be allowed to be placed to remember loved ones buried in other parts of the world. 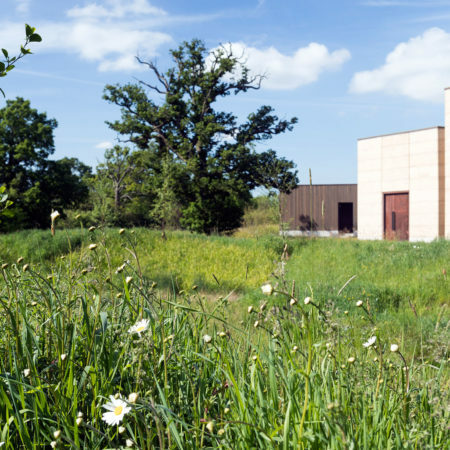 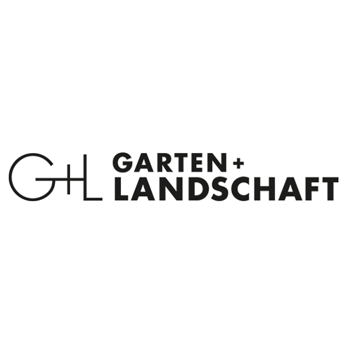 The garden is a semi natural place that sits comfortably in the agrarian landscape, planted with ornamental grasses and perennial planting to attract butterflies and bees in a simple arrangement that follows the natural lie of the land. 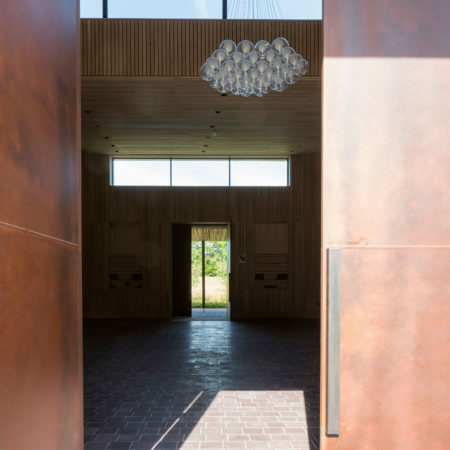 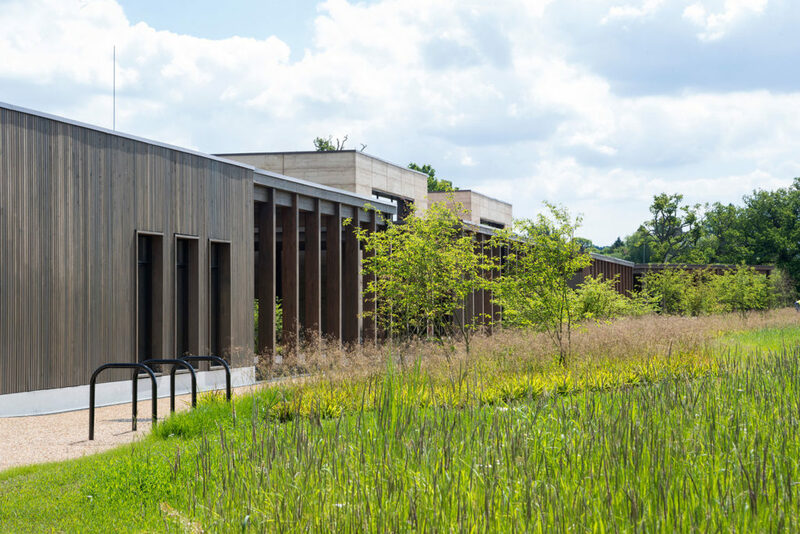 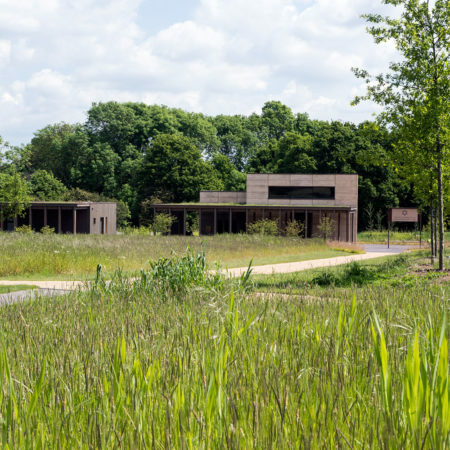 The design of the New Bushey Cemetery provides a subtle yet highly functional setting that is organised around the traditions of Jewish burial practice. 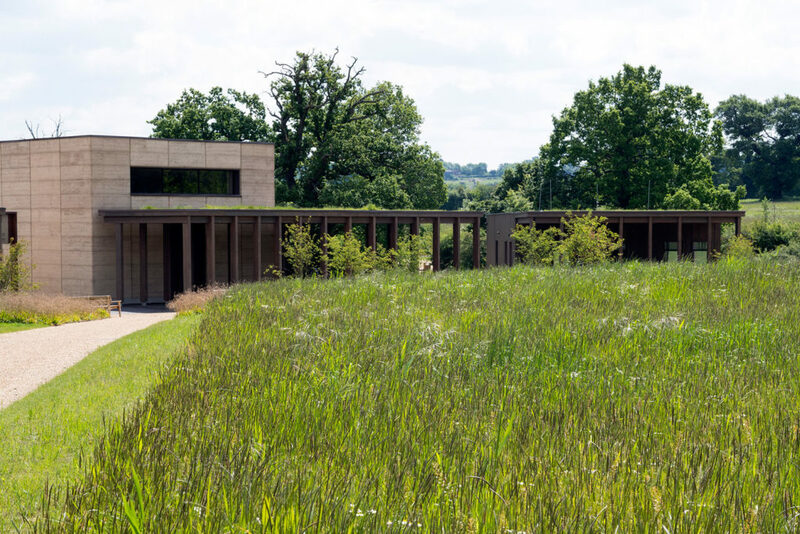 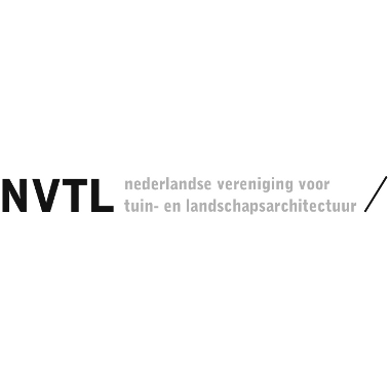 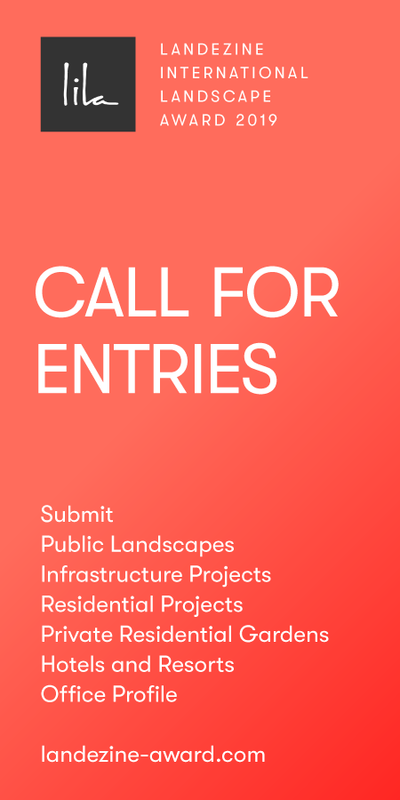 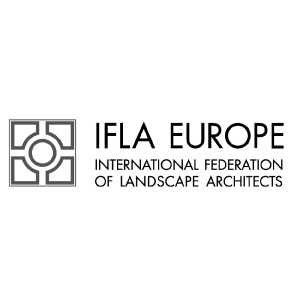 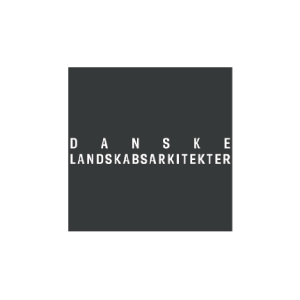 The design works at two distinct scales, the ceremonial landscape scale enabling space for dignified communal contemplation and remembrance and at a human scale more intimate and comfortable places that allow connection with the land and natural processes.